Fiji have announced their initial 43-man squad for the Rugby World Cup in September with 13 local players included in their plans. Following a series of trial matches in Suva, head coach and chairman of selectors Sam Domoni named the squad and will add a further seven players after updates on injuries and availability. The squad, which will also contest this season's Pacific Nations Cup, will be cut to 30 players for the World Cup in New Zealand later in the year. 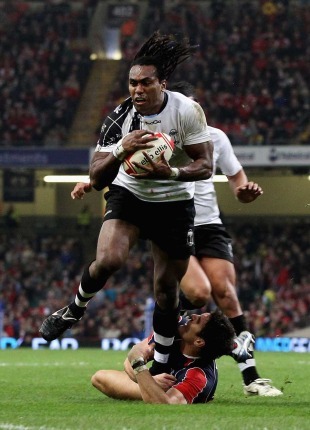 Former Clermont player Napolioni Vonowale is among the Fiji-based players included in the squad. "It's really pleasing to see the depth we have now in each position and the improvement being shown by our local players following their daily training environment programme," Domoni said. The build up to Fiji's squad selection has been fraught with disputes over whether all of their players will be allowed to enter New Zealand because of their ties with Voreqe Bainimarama, the military leader who seized control of the country in 2006. But the International Rugby Board said on Thursday that they were confident the issues would be resolved ahead of the tournament in September. Seremaia Baikeinuku, Vitoria Buatava, Sireli Bobo, Ilikena Bolakoro, Tevita Cavubati, Waisea Daveta, Adriu Delai, Graham Dewes, Ravai Fatiaki, Vereniki Goneva, Sekonaia Kalou, Sunia Koto, Sisa Koyamaibole, Wame Lewaravu, Nicky Little, Gabriele Lovobalavu, Waisale Luveniyali, Campese Ma'afu, Penijamini Makutu, Deacon Manu, Taniela Maravunawasawasa, Masi Matadigo, Joshua Matavesi, Kini Murimurivalu, Timoci Nagusa, Jimilai Naikadawa, Jone Nailiko, Sireli Naqelevuki, Akapusi Qera, Seru Rabeni, Malakai Ravulo, Ifereimi Rawaqa, Setefano Samoca, Nemia Serelevu, Netani Talei, Talemaitoga Tuapati, Waisale Vatuvoka, Viliame Veikoso, Malakai Volau, Napolioni Vonowale, Albert Vulivuli, Dominiko Waqaniburotu, Apisalome Waqatabu.